The symbol to the left, below the links, is the Tomoe, Imaizumi-Sensei's family crest. It embodies Sensei's approach to aikido - circular movement around a stable center. Imaizumi Sensei first started his aikido training in April of 1959 during his days as a student at Waseda University in Tokyo. He went to training sessions at the Aikikai Hombu Dojo, which was located within walking distance of the Waseda Campus. It was there that he first met Morihei Ueshiba (O-Sensei, the founder of aikido) during one of his aikido demonstrations. In 1965, with a rank of sandan, Imaizumi Sensei became an apprentice to the teaching staff (shidoin) at the Aikikai Hombu dojo and his career as a professional aikido instructor began. During this period he frequently would serve as uke, or training partner, for Ueshiba Sensei during the early morning aikido classes when O-Sensei would demonstrate and teach. After O-Sensei's death in April of 1969, Imaizumi Sensei was chosen to accompany Waka-Sensei (the son of O-sensei) and his wife to enshrine the remains of O-Sensei at the Ueshiba family graveyard at Tanabe. In the spring of 1972, Imaizumi Sensei made his first visit to the United States when he traveled to California and other areas of the western U.S. to teach aikido and ki principles on behalf of Koichi Tohei Sensei, who was Aikikai Hombu dojo head instructor at the time. After 3 months in California, Imaizumi Sensei returned to Japan and continued as an instructor at the Aikikai Hombu dojo until 1974 when he joined Tohei Sensei in his new organization, the Ki-no-kenkyukai (Ki Society; Shin-Shin Toitsu Aikido). Imaizumi Sensei returned to the United States in 1975 to help Tohei Sensei organize and run Ki Society dojos in New York and elsewhere. On June 1, 1980, he was officially assigned the post of Chief Instructor for the Ki Society in the United States. Following this three year assignment, he nominated Koichi Kashiwaya, then the Chief Instructor of the Boulder Ki Society in Colorado, for the position of Chief Instructor for the United States. Imaizumi Sensei retained his title as Chief Instructor for the New York Ki Society. In September of 1987, Imaizumi Sensei officially resigned from the Ki no Kenkyukai and returned to Japan in order to help with the management of his family's business there. He was able to return to the United States and resume his aikido career in April of 1988. Later that year (October 1st, 1988), he established a new aikido organization called Shin-Budo Kai. In the past, Imaizumi Sensei maintained a multi-state seminar schedule that included Arizona, Colorado, Georgia, Hawaii, Nevada, New Mexico, Texas, and Washington. Currently, Imaizumi Sensei teaches regularly at his dojo in New York City, while overseeing affiliated SBK dojos in Albuquerque, NM; Austin, TX; Bedford Hills, NY; Bedford, TX; Cornwall Bridge, CT; and Durango, CO. He also conducts an annual seminar in Albuquerque hosted by ASBK..
Ralph Bryan Sensei, 5th Dan and Chief Instructor at ASBK. Ralph first experienced aikido during a semester of study at the University of Hawaii at Manoa in 1976 – attracted to its philosophical underpinnings and noncompetitive approach. Returning to Austin, TX that same year, he practiced with the Austin Ki Society for 2 years. Medical school intervened from 1978 – 1982 after which Ralph resumed aikido practice with Mitsugi Saotome Shihan at Aikido Shobukan Dojo in Washington, DC from 1982 – 1987. Professional obligations intervened again when he joined the Centers for Disease Control and Prevention (CDC) in Atlanta in 1987. He resumed aikido practice in 1994, training sequentially under Wade Ishimoto Sensei and Jim Redel Sensei until 2006. Shizuo Imaizumi Shihan certified Ralph as a Chief Instructor March 2006 and promoted him to Godan on September 1st, 2016. Since retirement from CDC in 2010, Ralph is increasingly focused on aikido pursuits. He is the editor and principal author of The Aikido of Shin-Budo Kai, A Guide to Principles and Practice. Jennifer Miyashiro Sensei, 3rd Dan, Assistant Chief Instructor. Jennifer’s first exposure to aikido was in the 1980s when she watched her cousin participate in a demonstration on Maui. Although she was impressed by the fluid movements and power of the art, it wasn’t until 2001 that she decided to give it a try herself. 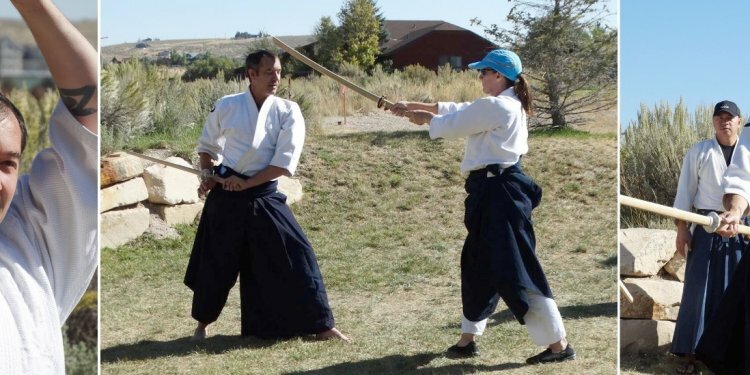 That year she began her aikido training in Shin-Budo Kai style aikido in Albuquerque. Since 2006, she has studied under Ralph Bryan Sensei. After years of practice with her fellow aikidoka, she is still impressed by the powerful grace that this martial art can generate. Jennifer was promoted to Sandan in October, 2015. Bob Thomas Sensei - 3rd Dan, Assistant Instructor Emeritus. Bob started his martial arts training in Okinawan Karate in 1983 under the instruction of Fred Absher Sensei. He currently holds the rank of Nidan in Kojasho Karate. Wade Ishimoto Sensei was a colleague at Sandia National Laboratories, and at Wade's encouragement, Bob first practiced aikido in 1991. He began his full-time study of aikido in 1997 under the instruction of Jim Redel Sensei. He gained the rank of Shodan in 2003. Bob has studied under Ralph Bryan Sensei since 2006 and received the rank of Sandan in September 2010.